Use JEB to reverse engineer closed-source Ethereum smart contracts and dApps. Cut down on costly reverse engineering time: decompile Ethereum smart contracts to Solidity-like source code to easily understand and review closed-source contracts and dApps. Decompile EVM contract code to Solidity-like high-level code using our Ethereum decompiler. Annotate the analysis results to better understand what the compiled contract or dApp is doing. Automate or script your reverse engineering tasks via our API. Example: See a decompiled output of the geneScience contract used by the popular CryptoKitties dApp. The decompiler takes compiled smart contract EVM code as input, and decompiles them to Solidity-like source code. The initial EVM code analysis passes determine contract's public and private methods, including implementations of public methods synthetically generated by compilers. Code analysis attempts to determine method and event names and prototypes, without access to an ABI. Implementations of well-known interfaces, such as ERC20 for standard tokens, ERC721 for non-fungible tokens, MultiSigWallet contracts, etc. 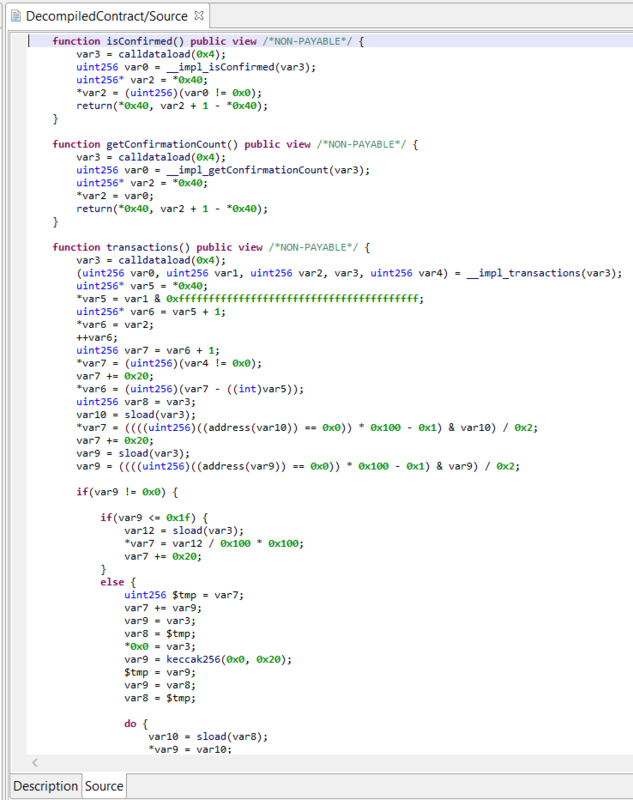 The decompiler uses JEB's optimizations pipeline to produce high-level clean code. 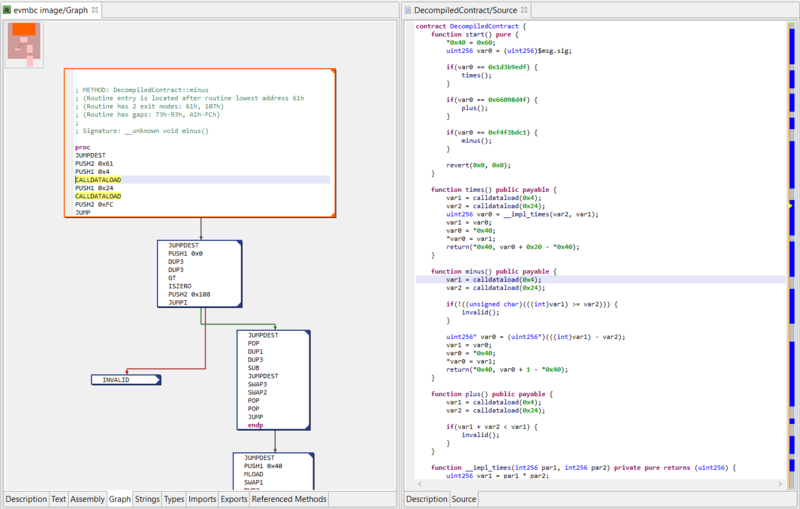 It uses JEB code analysis core features, and therefore permits: code refactoring (eg, consistently renaming methods or fields), commenting and annotating, navigating (eg, cross references), typing, graphing, etc. Users have access to the intermediate-level IR representation as well as high-level AST representations though the JEB API. More generally, the API allows power-users to write extensions, ranging from simple scripts in Python to complex plugins in Java. Our Ethereum modules were tested on thousands of smart contracts active on Ethereum mainnet and testnets. Head over to our blog and read up to learn more about the current features and limitations of JEB Ethereum Decompiler.